February Current Affairs. 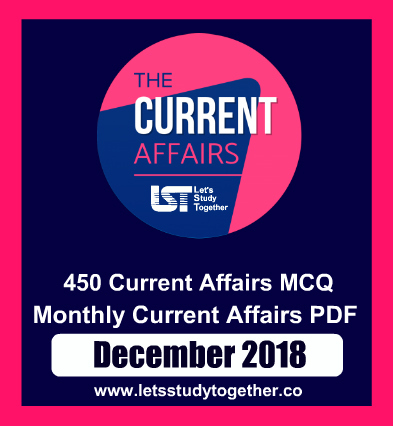 Important Current Affairs Questions – 6th February 2019. Daily Important Current Affairs. Daily Current Affairs PDF. Welcome to the www.letsstudytogether.co online Current Affairs section. If you are preparing for IBPS PO/Clerk, Canara Bank PO, banking & Insurance, SSC , Railways and other competitive exams, you will come across a section on the Current Affairs. Here we are providing you “Important G.K. & Current Affairs Questions “ in PDF format based on the current events for your daily practice. 1.Ministry of Coal entered into a Memorandum of Understanding with _________ to foster relations in the field of coal mining and clean coal technologies. Explanation: Ministry of Coal entered into a Memorandum of Understanding with Ministry of Energy, Republic of Poland. The MoU has been signed between Sh. Haribhai Parathibhai Chaudhary, Hon’ble Minister of State for Coal and Mines and Mr. Grzegorz Tobiszowski, Secretary of State, Ministry of Energy, Republic of Poland. Additional Secretary, Ministry of Coal, Shri Suresh Kumar, and Ambassador of Poland HE Mr. Adam Burakowski were present on the occasion. The objective of this MoU is to foster relations in the field of coal mining and clean coal technologies through the already established Joint Coal Working Group as well as research institutes and academia. 2. NTA has recently launched a ‘mobile app’ through which students can practice or take mock tests on their own computers or smart phones. Expand NTA. Explanation: National Testing Agency (NTA) has launched a ‘mobile app’ through which students can practice or take mock tests on their own computers or smart phones. In order to ensure that no student is disadvantaged due to lack of resources, NTA has established a network of more than 4000 Test Practice Centres (TPCs) to acquaint the aspirants, especially those from rural areas with Computer Based Tests (CBTs). Students across the country can register themselves online at NTA Website or ‘NTA Students App’ for visiting the TPCs. All these services are provided to the students free of cost. So far, more than one lakh students have registered at these TPCs and more than one crore students have benefited from these ‘App & Web’ services. 3. First State Level Awareness Programme on Agri Export Policy was recently held in ______. Explanation: First State Level Awareness Programme on Agri Export Policy was recently held in Pune. Commerce Minister, Suresh Prabhu, in his address at the first state level awareness programme on agriculture export policy said that in order to achieve the purpose of the policy clusters have been identified across the country for development of agriculture exports. In Maharashtra, six clusters have been identified for grapes, mango, pomegranate, banana, oranges and onion for successful implementation.Farmer Producer Organizations (FPO’s) and co-operatives should be linked with the farmers and exporters. Required infrastructure needs to be provided in these clusters and use of latest technology in agriculture has to be adopted. He also stressed on attractive packaging in order to increase the demand for the identified products. Indian Institute of Packaging has been roped in for working on packaging standards for international markets. 4.The 22nd All India Institute of Medical Sciences (AIIMS) will be established in __________. Explanation: The 22nd All India Institute of Medical Sciences (AIIMS) will be established at village Manethi in Haryana’s Rewari district. An area of over 220 acres has been identified for this purpose. Another important Government of India project, the National Cancer Institute at Badsa district Jhajjar, the first institute in northern India to have proton facility for treatment of cancer, is likely to be fully functional by February or March 2019. 5. _______ recently launched India’s first PolicyHack for teachers. Explanation: Dell, as a part of its three-city PolicyHack series, hosted an interactive hackathon, where teachers focused on their learning journey. In a first-of-its-kind hackathon for teachers, Dell has partnered with the UNESCO Mahatma Gandhi Institute of Education for Peace and Sustainable Development (MGIEP) and Ignus,to create a platform where teachers, school representatives and a cross-sectional group experts related to education can interact with each other. Dell plans to present three more PolicyHacks in other regions of the country in 2019, in an endeavour to foster and cultivate innovative ideas on how teachers can leverage technology for themselves and for the benefit of their students. PolicyHack is a global forum of Public Policy discussions, curated under the umbrella of Realizing 2030 – wherein Dell strives to explore and realize the true potential of technology to drive human progress. 6._________ has been named the “highest ranked” Indian think tank in the “2018 Global Go To Think Tank Index Report”. Explanation: Observer Research Foundation (ORF) has been named the “highest ranked” Indian think tank in the “2018 Global Go To Think Tank Index Report”. Globally, ORF has been ranked as the top think tank in the “Best New Idea or Paradigm Developed by a Think Tank” category, said the report by the Think Tanks and Civil Societies Programme (TTCSP) of the Lauder Institute at the University of Pennsylvania. 7. 2nd ASEAN-India Youth Summit has been recently inaugurated in _______. 8. The theme for World Cancer Day 2019 is ____________. Explanation: World Cancer Day is an international day, which is marked on 4th February to increase awareness of cancer, and to encourage its prevention, early detection and treatment. Every year the theme has its own theme. The theme for World Cancer Day 2019 is – ‘I am and I will’. The estimated number of deaths due to cancer in 2018 was 9.5 million, which amounts to a whopping 26,000 deaths a day. This number is expected to increase as environmental stresses increase, air quality worsens, lifestyles and eating habits too! 9. _______ has been rated as the most liveable location for Asian expatriates in 2019 for the 14th consecutive year. Explanation: Singapore has been rated as the most liveable location for Asian expatriates in 2019 for the 14th consecutive year, according to a survey by ECA International, a global agency focusing on solutions for businesses operating across borders. “Unsurprisingly for many, Singapore once again remains the most liveable location in the world for expats relocating from elsewhere in East Asia,” the agency’s regional director in Asia Lee Quane said in an online briefing. 10. ___________ was declared winner of the CIMA Award, as part of the leading art gallery’s effort to search country-wide talent in visual arts. Explanation: Young Maharashtra-based artist Shashikant Patil was declared winner of the CIMA Award having a cash value of Rs 5 lakh, as part of the leading art gallery’s effort to search country-wide talent in visual arts. Patil, who hails from a village in Maharashtra, got the award for his painting installation ‘Transformation’. It also included a trophy and a solo exhibition opportunity. 11._________ recently launched the first phase of the countrywide Sehat Insaf Card scheme to provide free medical treatment. Explanation: Prime Minister Imran Khan launched the first phase of the countrywide Sehat Insaf Card scheme to provide free medical treatment to approximately 80 million people. The card, which falls under the PTI’s Sehat Sahulat Programme, was part of a health insurance scheme first launched by the party in Khyber Pakhtunkhwa in 2016. 12. The government has recently approved setting up of three new naval air squadrons in Gujarat and _________. Explanation: The government has approved setting up of three new naval air squadrons in Gujarat and Tamil Nadu as part of efforts to bolster the Indian Navy’s overall strength. The government has also sanctioned recruitment of manpower for manning additional aircraft in existing Dornier surveillance squadrons in Kerala and Andaman Islands. A contract for procurement of 12 Dornier aircraft was signed with Hindustan Aeronautics Ltd two years back and their delivery is commencing soon. 13.Which among the following countries will pardon 50,000 convicts on 40th Islamic revolution anniversary? Explanation: The Iranian Judiciary Chief Amoli Larijani said 50,000 convicts will receive pardons from Leader Ayatollah Khamenei on the occasion of the 40th anniversary of Iran’s 1979 Islamic Revolution. Ayatollah Sadegh Amoli Larijani, the Iranian Judiciary Chief, was quoted by Fars as saying at a meeting with the country’s senior judicial authorities that 50,000 convicts will be pardoned or their sentences reduced on the occasion of the 40th anniversary of Iran’s Islamic Revolution. 14.India’s richest civic body Brihanmumbai Municipal Corporation (BMC) presented a Rs. _______ budget for Mumbai city. Explanation: India’s richest civic body Brihanmumbai Municipal Corporation (BMC) presented a Rs. 30,692 crores budget for Mumbai city today, which is around Rs. 3,500 crores more than the previous one. The BMC Commissioner Ajoy Mehta presented the budget to the Standing Committee chairperson Yashwant Jadhav. 15.Indian Banking Association recently requested banks to waive off the processing, documentation, inspection and all other service charges for Kisan Credit Card and crop loans upto ________ rupees. Explanation: Indian Banking Association has issued advisory requesting banks to waive off the processing, documentation, inspection and all other service charges for Kisan Credit Card and crop loans upto three lakhs rupees. Agriculture Ministry in a release said, there are over 21 crore small and marginal farmers in the country and providing them timely and affordable credit is the key to attaining inclusive growth.